We are counted as the well-known manufacturer, exporter, trader and supplier of quality approved Non Woven Slippers. Specially design for wearing inside the home or rooms, these room slippers are designed consuming quality assured basic material and finest technology. According to the details given by our customers, these room slippers are provided in different dimensions and other correlated stipulations. In addition, clients can purchase the offered room slippers from us at pocket friendly rates. 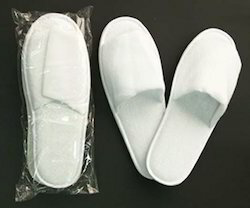 Looking for Non Woven Slippers ?